To make crostinis: Preheat oven to 350 degrees. Place baguette slices on a large baking sheet. Drizzle with olive oil and sprinkle with coarse salt. Bake 7-8 minutes, until just crisp. Allow to cool. To build crostinis with toppings: Spread cheese on each crostini. Layer with desired toppings and sprinkle with freshly cracked black pepper and crushed red pepper flakes. Serve. 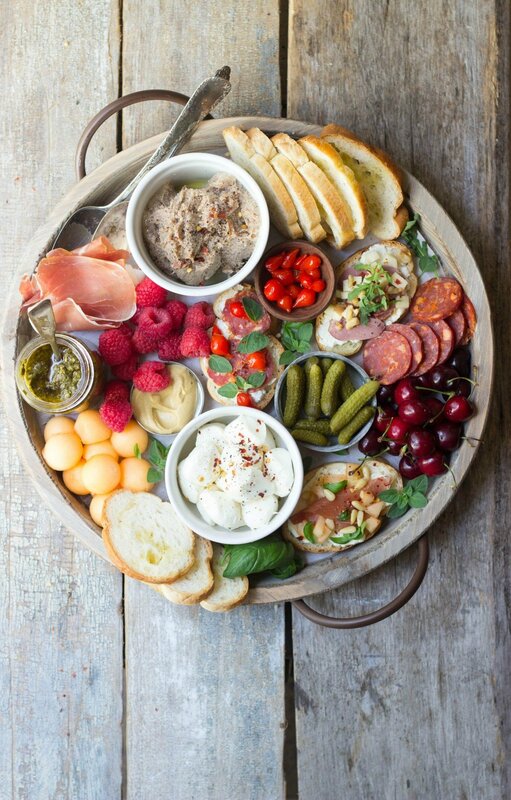 To build charcuterie board: Create heaps of desired charcuterie board essentials on a large platter, including assembled crostinis. Be sure to have a mix of cheese, meats, pickled vegetables, breads, fruit, dips/spreads and nuts.